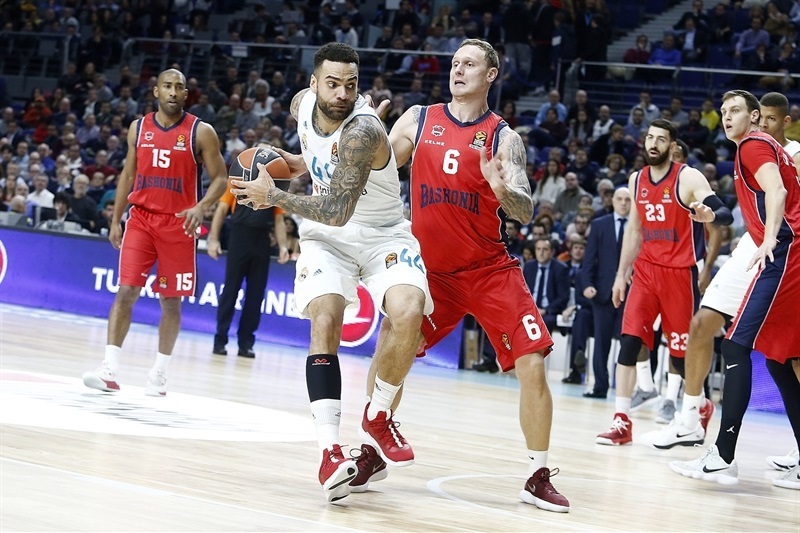 In a thriller that came down to the final seconds, Real Madrid registered its seventh consecutive EuroLeague win by edging Baskonia Vitoria Gasteiz 75-73 in the Spanish capital on Wednesday. Madrid climbed to 12-6 in the standings, while Baskonia dropped to 8-10. 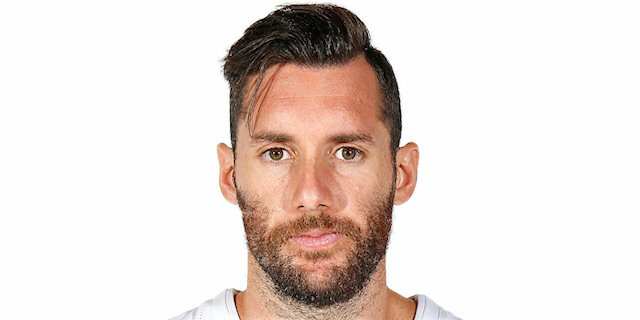 A jumper by Rudy Fernandez with just 2.9 seconds proved to be the difference. 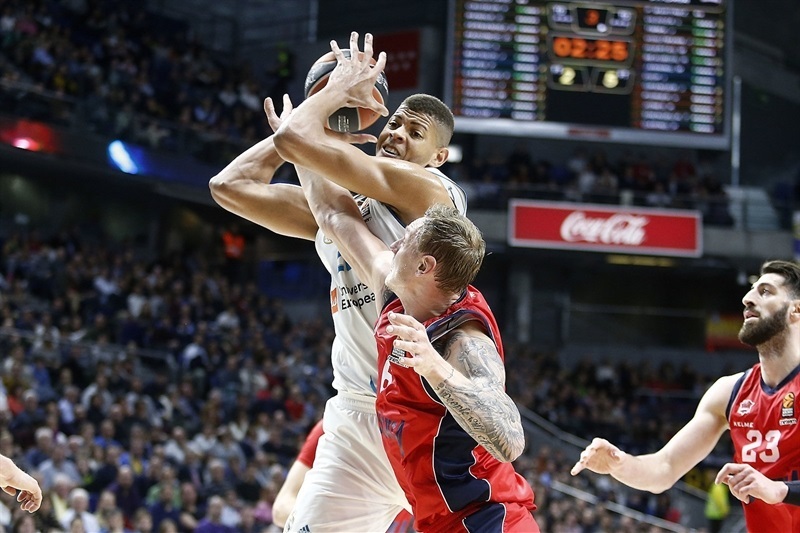 Trey Thompkins and Fabien Causeur led the winners with 13 points apiece, Fernandez and Luka Doncic each scored 12 and Walter Tavares had 11 for Madrid. Rodrigue Beaubois led Baskonia with 18 points and Johannes Voigtmann and Matt Janning each had 10 for the visitors. 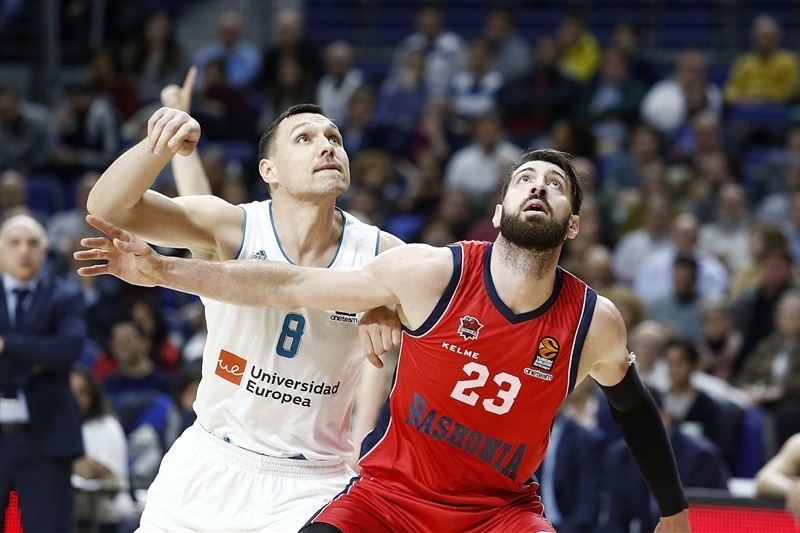 In a game that was close throughout, Baskonia appeared on the verge of victory with a 64-72 lead midway through the fourth quarter, but a final 11-1 run that Fernandez capped with the game-winning shot allowed Madrid to keep its winning streak going. Causeur got Madrid going with a driving layup. Thompkins added free throws and a backdoor slam by Jeffery Taylor gave the hosts a 6-3 edge. Toko Shengelia followed a fade-away jumper with a three-pointer in a 0-9 run that Beaubois capped with a fast break layup, good for a 6-12 Baskonia lead. 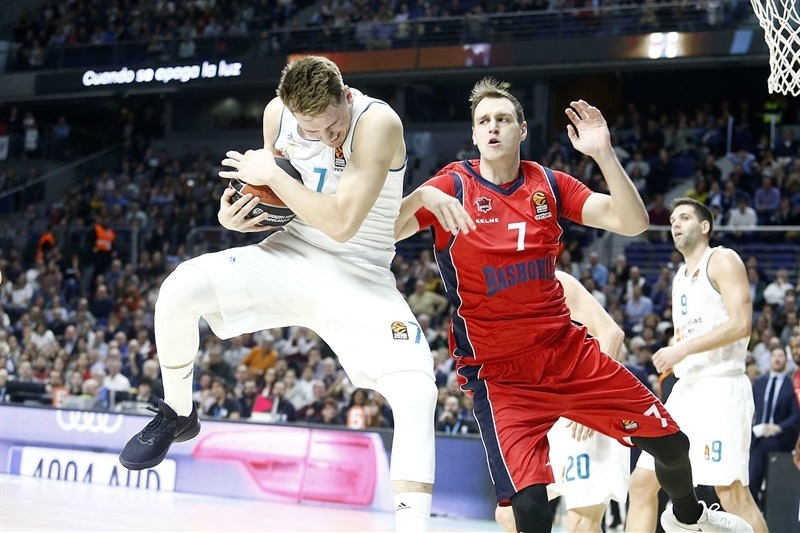 Doncic rescued Madrid with a three-pointer and free throws, but a power layup by Shengelia and a triple by Beaubois kept Baskonia ahead, 13-17. Fernandez answered from downtown and a buzzer-beating layup by Doncic put Madrid up 18-17 after 10 minutes. 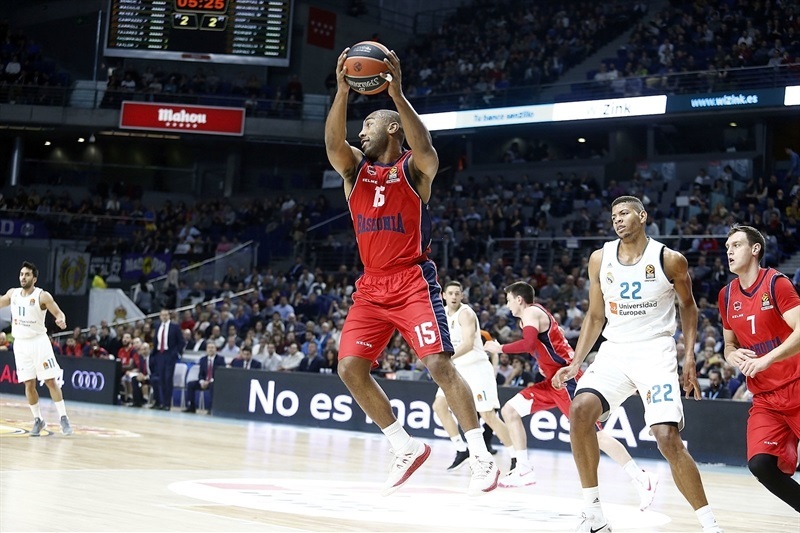 Beaubois took over with a coast-to-coast layup early in the second quarter and back-to-back triples by Luca Vildoza gave Baskonia a 20-25 edge. 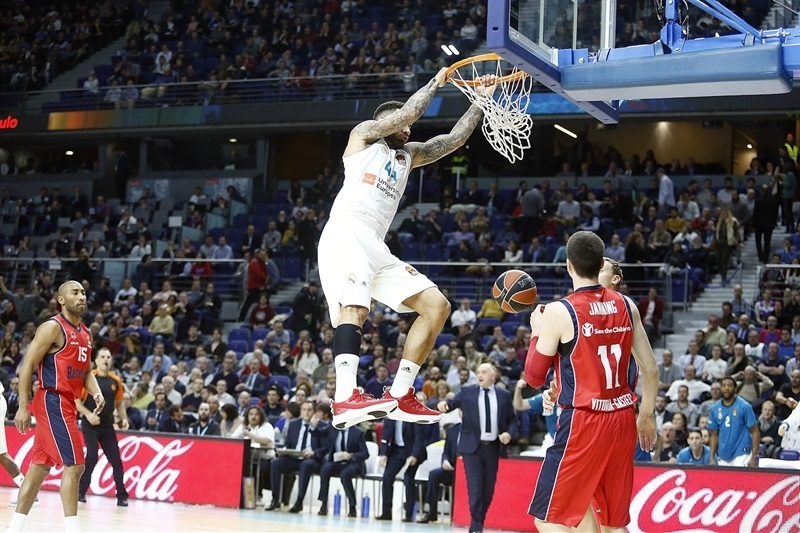 Reyes tried to change things with consecutive layups, but baskets by Vincent Poirier and Kevin Jones prompted Madrid to call timeout at 24-31. Fernandez and Facu Campazzo combined for all the points in an 8-0 run. After Janning struck from downtown, a layup by Tavares fixed the halftime score at 34-34. Janis Timma followed a triple with a jumper right after the break. 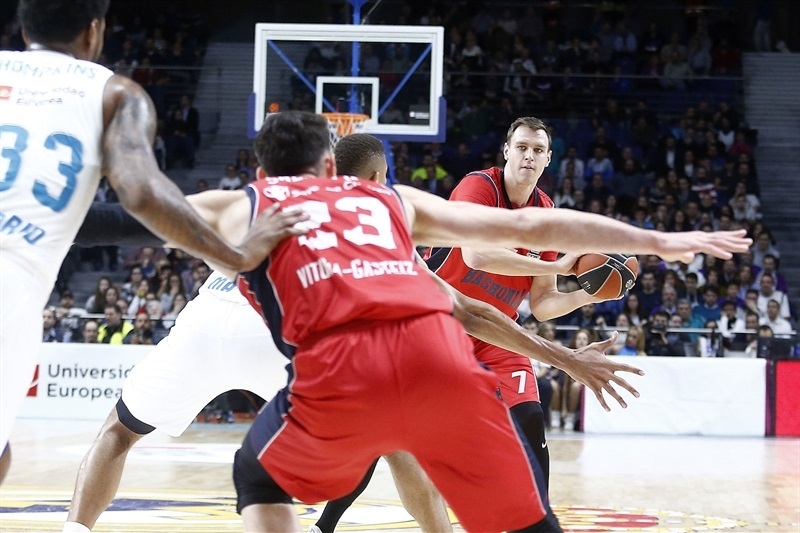 Causeur struck from downtown and Tavares added a dunk-and-foul, but back-to-back three-pointers by Beaubois kept Baskonia ahead, 40-45. 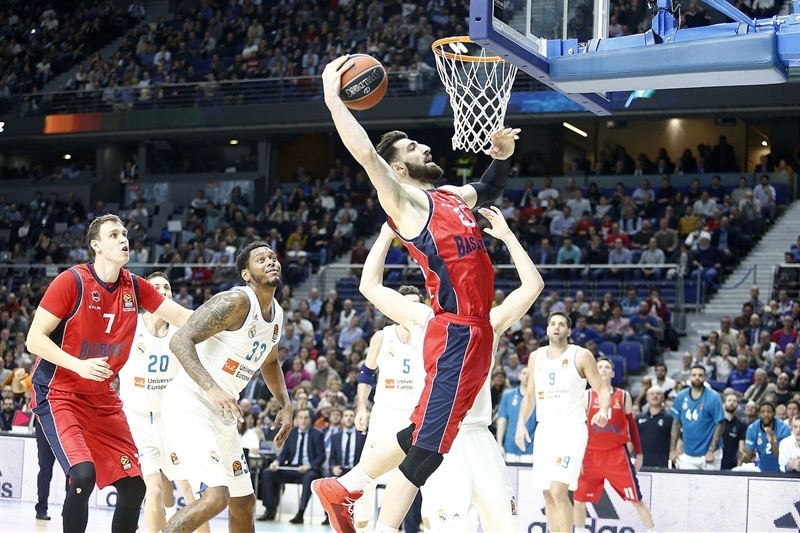 Causeur sank two more from beyond the arc, Thompkins joined the three-point shootout and consecutive put-back layups by Tavares gave Madrid a 53-50 lead. 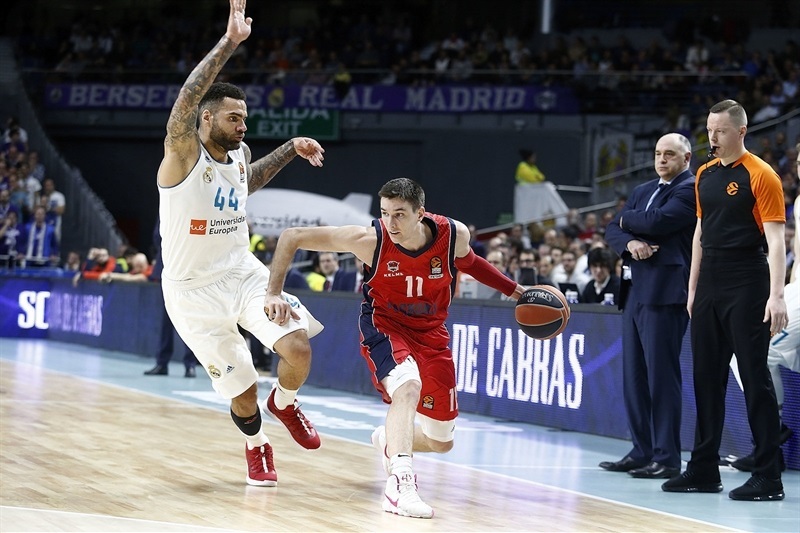 Janning followed a floater with a three-pointer, but Thompkins and an unstoppable Causeur restored a 59-57 Madrid lead. Free throws by Voigtmann and a layup by Shengelia gave Baskonia the lead, 59-61, after 30 minutes. Janning scored down low early in the fourth quarter and a layup-plus-foul by Jayson Granger made it a 5-point game with seven minutes left. Poirier and Beaubois soon boosted the visitors' lead to 64-72. 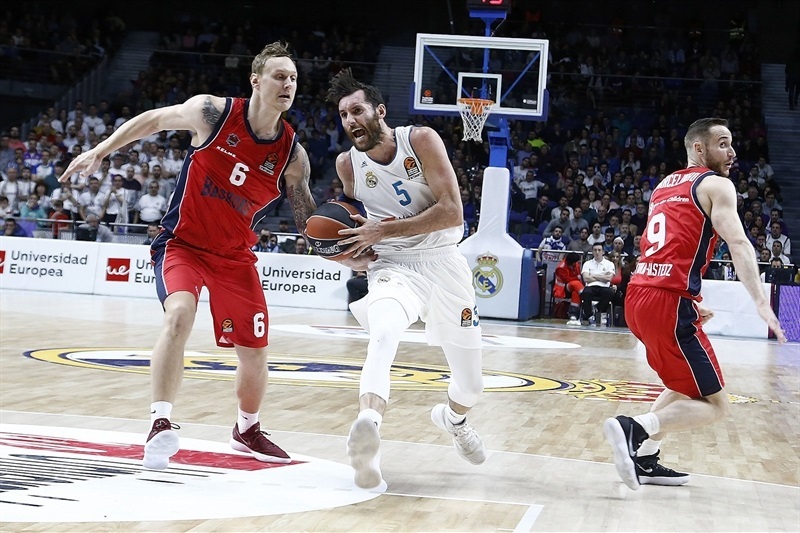 Thompkins scored a couple of layups and Doncic made free throws in a 7-0 run that brought Madrid back to life at 71-72. 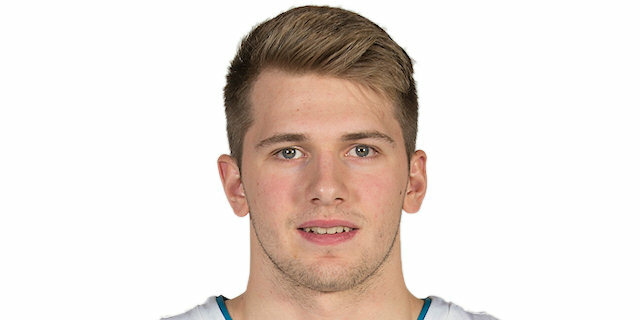 Beaubois split free throws, but Doncic tied the game with a close basket. Shengelia missed around the basket and Fernandez swished a jumper with 2.9 seconds remaining. Baskonia had a chance to win, but Granger missed from way downtown at the buzzer. "First of all, congratulations to my players. I am very happy with the win and the team's performance and also because of the effort we had to make to win the game. I got into the locker room and saw them tired, as if they were not enjoying a win that deserves a lot of credit, against a great team. We had better and worse moments in the game but we were also playing against a good opponent. We were able to stay focused for the best part of the game. It the end, it was a very close game that was decided in the final play. I am happy with the work we did today. We know it was an important game for us to lock our spot in the EuroLeague as much as possible. We have a good winning streak in the EuroLeague, but lost a couple of games at home and those wins are the ones we miss the most. We wanted to win at home, knowing it is a difficult week with a game in Malaga on Friday and in San Sebastian [in the Spanish League] on Sunday." "It was a close game. 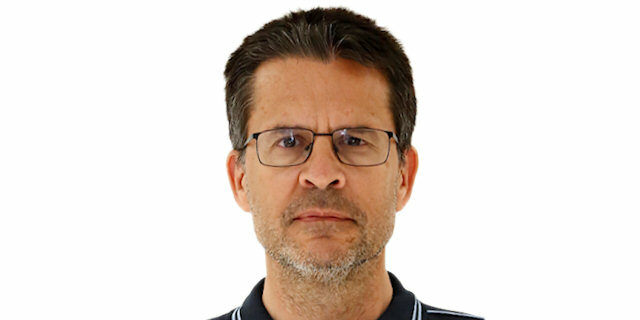 I believe that we played with very good rhythm in the second half for many minutes, but when Madrid switched to zone defense, we stopped playing and took shots that were not bad, but rushed. We didn't hit them and Madrid returned to the game. After that, it could have gone either way and we didn't win. 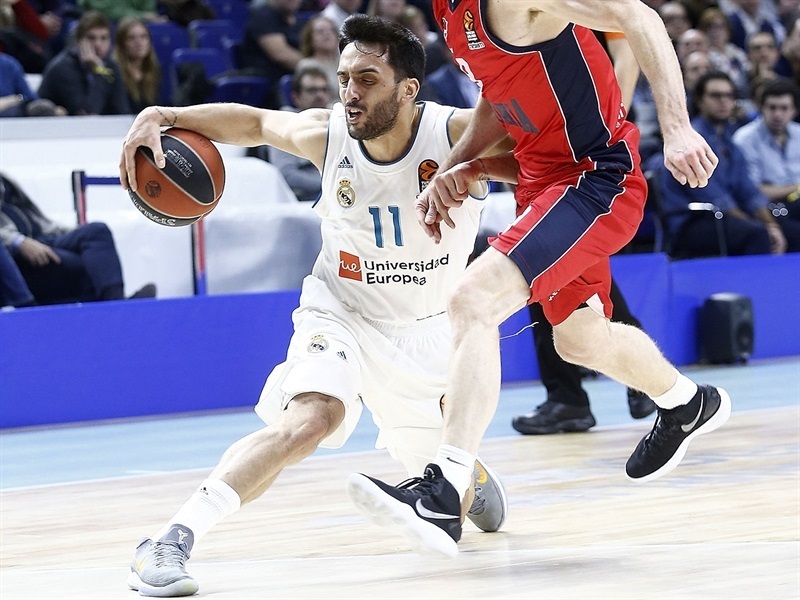 Madrid has players who are tremendously active on defense and able to collect steals, like Facu Campazzo, Rudy Fernandez and Fabien Causeur. It is also true that some of our 21 turnovers – 2 of them inbounding the ball – were not really forced ones. These mistakes are always penalized. We are not a team that commits many turnovers, but had more than average tonight." "This is a very important win. We are in a very good spot in the standings and even though we have a lot of games left, it is an important win and we have to keep playing this way. We allowed only 73 points against a great team. Each player could hurt us, but we did well on defense. Then on offense, we did not do that well, but we won the game and that is what matters. We are working well, especially in practice and the team chemistry is key; we get along very well. I never thought the game was lost, I never think that until the final second. Shengelia missed a lot that I thought was going in, but it didn't. I always have hope in this team and we proved it today. We were down by 7 with four minutes left, but that is a lot of time. We were all a bit nervous, but we proved that four minutes is a lot." "It was a very tough game. I think that Baskonia is an unbelievable team. We tried to improve in the second half, playing better defense and selecting better shots. Defense was the key in the last quarter. They scored a lot of points, but we tried to be more aggressive in the second half."